Over the past six months, I have attended Chuck E. Cheese's in three locations - Lynwood, Cerritos and Lakewood. I have realized a sad truth of life - the violent and popular Whack-a-mole is being replaced by a lame video version of the game. Yeah, you heard me right. The classic Whack-a-mole is being replaced. ... Is nothing sacred? I am enjoying Chuck E. Cheese's more of late, but I still feel jilted. Back in the '80s, the pizza place transformed from an arcade with Asteroids and Centipede to a "family friendly" place with hardly any fun video games. Eventually, I learned to accept Chuck E. Cheese's for what it was, and Whack-a-mole and skeeball became my games of choice there. With Whack-a-mole going digital, I guess I might replace it with Pop-a-shot. But when will all of these changes end? 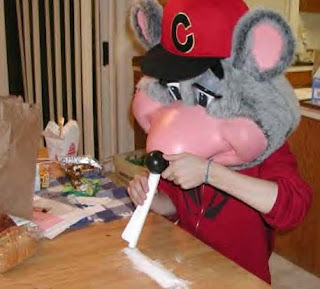 With the help of some Internet research, I discovered a photo of Chuck E. Cheese doing blow. That explains a lot. Presumably, he was big into coke in the '80s when he also was into Asteroids and Centipede. He obviously had to stop snorting nose candy, and it helped him kick his expensive habit by getting rid of heart-pumping video games and replacing them with staid kiddie stuff. Of course, with Whack-a-mole being replaced, there is a chance Chuck is making that ill-conceived change because he has reverted to his cocaine ways.